Cornbread is among my formative childhood memories. Amá made it especially for family celebrations, and to make cornbread dressing with pecans and raisins. Corn arrived in Texas around 900 AD, and it was the Caddo civilization in East Texas that cultivated and developed the grain into a major commercial crop. The Caddos baked corn cakes in clay pots, making it the very first Texas cornbread. The popular name of the Caddo was Texas. In surviving Spanish documents, Texas is the name ascribed to the Caddo kingdom. Today all Texans owe a debt of identity and nutrition to the Texas people. (In the Spanish alphabet, the “x” is pronounced like an “h,” as in the word, “México). As a result of the policies of ethnic extermination, the Texas people were forcibly removed from their homes into Oklahoma in 1859. Every year, they return to visit one of their ancestral homes, near Nacogdoches, Texas, to The Caddo Mounds State Historic Site. This cornbread recipe approximates my mom’s in taste and texture. It has a higher ratio of corn meal to wheat flour than most recipes in the northern US, and it’s definitely not sweet. You’ll notice the reduced fat content. Cornbread recipe has more corn than wheat, and low in fat. I like to make this cornbread often not only because it brings back memories of my family, but also because it is a prime example of the beautiful marriage between Native American cuisines and European cuisines. Texas, Caddo, cooks were making cornbread before the arrival of Europeans in 1528, and Europeans were making wheat bread before they immigrated to our shores. Texas corn met imported wheat. They liked each other and a beautiful friendship was born. It’s typical of Texas Mexican versions, actually of most Southern US versions, to add more corn than wheat, and also to avoid adding sugar to make it sweet. We don’t fiddle much with the natural flavors. The small amount of sugar in this recipe is to help maintain the moisture in the bread. I think you’ll enjoy the extra crunch, especially the nice crust that forms by heating the cast iron skillet before pouring in the batter. 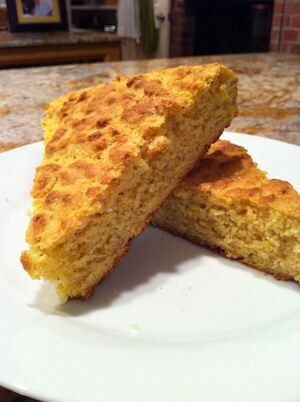 Again, this crust is typical of almost all Southern US style cornbread recipes. published by Texas Tech University Press. 3. Sift together the wheat flour, soda, baking powder, sugar and salt until thoroughly mixed. 6. Add the buttermilk and the melted butter to the beaten eggs and stir until fully mixed. 7. Pour the egg and buttermilk mixture into the dry ingredients and stir gently with a large spoon, just enough to incorporate the liquid. 8. Remove the cast iron skillet from the oven and pour the batter into it. Sizzle! Place in the oven and bake for about 20-30 minutes until golden brown.